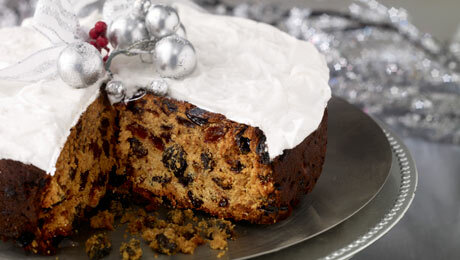 Try out this delicious Christmas cake over the festive season! Preheat the oven to 160°C, Fan Oven 145°C, Gas Mark 2. Prepare an 8inch/20cm round cake tin by lining the base and the sides with SuperValu greaseproof paper. Tie a double band of brown paper around the outside of the tin. Cream the butter and sugar until light and fluffy. Gradually beat in the eggs and continue mixing. Sieve the flour and mixed spice into a separate bowl and fold half of this into the mixture. Stir in the sultanas followed by the remaining flour and spice. Once mixed, stir in the currants, raisins, glacé cherry and citrus peel mix and the chopped almonds. If you are adding the optional ingredients, the lemon, orange and apple should be added along with the dried fruit. The whiskey/ brandy should be drizzled over the cake when it is cool. Heat the apricot jam in a small saucepan on a medium heat until it starts to boil. Place the icing sugar and caster sugar in a mixing bowl with the ground almonds. In a separate bowl, lightly beat the egg yolks, almond essence, lemon juice and rum. Gradually add the egg yolk mixture to the almonds and sugar and knead to make a soft but not sticky dough. Turn onto a clean surface, which has been dusted with icing sugar, and knead until smooth. If you’re not using the paste straight away, keep covered with plastic wrap to prevent it drying out. If the cake isn’t very level, turn the cake upside down and cover the base instead of the top (the top and sides of the cake are covered separately). Measure around the circumference of the cake using a piece of string. Brush the top with boiled apricot jam. Dust a clean surface with icing sugar and roll out one third of the almond paste into a circular shape. Turn the cake onto the paste and trim away excess almond paste with a sharp knife so it fits exactly on the top of the cake. Turn the cake carefully and set on a cake board. Brush the sides with the remaining apricot jam and roll out the remaining almond paste to a rectangular shape, the length of the piece of string. The width should be about the same height as the cake. Carefully roll-up the almond paste and smooth onto the sides of the cake. Trim away the excess with a sharp knife so that the paste fits the shape of the cake. Leave the cake for about five days so that the almond paste has a chance to dry before covering with royal icing. Lightly whisk the egg whites in a large mixing bowl until they are just beginning to get frothy. Stir in a couple of spoons of icing sugar and beat with a wooden spoon until smooth. Gradually add the rest of the sugar, beating well between each addition. Stir in the glycerine – this keep the icing soft for decorating. If you fancy flat icing your cake, keep the icing fairly soft – a wooden spoon should stand upright in the icing and slowly fall to one side. For piping, you should add more icing sugar to make a stiffer icing which will hold its shape. Spread this over the cake and decorate as desired. Be as imaginative as you like! Make the icing a day ahead, cover and leave overnight. The air bubbles will rise to the surface and you’re more likely to have a smoother finish. Excellent recipe, third year making it, big hit with everyone! At least once a week, more if you desire. how often do you drizzle the whiskey over the cake? Made 2cakes as per recipe and it was devoured almost immediately once it was cut. However in relation to cake number 2 I made and applied the almond paste but i didn't make the icing.....therefore i have a few questions - how long will a cake with almond paste applied last and how best can i preserve it before it goes off? Made Christmas cake for the first time ever. Followed all instructions including soaking fruit in whiskey the night before. Did marzipan and iced over different days. Oh my god, the fun we all had as a family doing the icing. Need I say never done before but I will be doing again next year. Cake was excellent I might add. Thanks for giving me the confidence. Next year maybe the xmas pudding!! I baked mine today and after 2hrs it didnt look near cooked so i left it for another hour. Skewer came out clean after 3hrs but didnt look that dark. Is it meant to be light coloured? Hi Theresa. There is no need to amend the ingredients for the cake as it will still work out perfectly for the 9" tin, although it won’t be as high as per a 8” tin. Hi Michelle. It's just plain flour that you need to use. There's no need to add a raising agent. Hope that helps! Made my first Christmas Cake this year thanks to Kevin! I have nine inch tins. How much would I need to increae the ingrediants by? Thank you for a wonderful recipe, when I put the almond icing on the cake and I leave for 5 days do I cover with greaseproof paper of just leave open. Thank you so much again! I want to make the cake and cover it with a baked marzipan. Do I use jam or just cover it with marzipan and bake again? For how long? Hi Denise, it is better to cover with greaseproof paper although kitchen paper will do fine, as it will protect the marzipan from dust and strong odours etc while the marzipan dries out. Hi Helen, we recommend that the cake is covered in a thin layer of apricot jam and then add the marzipan. We suggest making marzipan (350g ground almonds, 175g Icing sugar, 175g caster sugar, 3 eggs, 1 tsp lemon, ½ teaspoon almond extract) and place it over the cake. There is no need for the cake to be baked again once the marzipan is added. Hi Marie, Kevin would recommend that the cake is made approx 4 weeks in advance, then add a drizzle of whiskey once every week to keep the cake moist. If not using alcohol we would recommend the cake is made 3 weeks in advance. Hope that helps! I have a 7inch round tin which seems higher than normal!! mixture has about 2,5inch to rise is this ok? Kevin, cut the cake today, Christmas. First cake I ever baked. All eyes were on me for the verdict on the first slice. Perfect. My 88 year old mum who is a fantastic baker was very impressed. Made my day. Looking forward to next year's already. Happy Christmas and thanks! Made as per instructions except I added extra whole cherries, small chunks of crystalized ginger, a tablespoon of black treacle and halved dates, all soaked in quarter bottle of Baileys for 2 days. You can't have a christmas cake without adding a drop of whiskey to it? or 3. Drizzle over the cake when baked (approx 150 - 200mls depending on taste). Hi Declan, The 7” tin will work, however the cake will be a bit taller than if using a wider tin. It should not rise more than 2.5” when cooked, and again drizzle with a little whiskey or brandy to keep moist. Hi Claudia, The light colour is fine, once the cake is cooked through. We would recommend drizzling with some whiskey or brandy to keep moist. Hi Anna. It is possible to omit the butter without affecting the quality of the cake however Kevin does recommend including it. Hope that helps! Hi Caroline. Bake the cake for approx 2 hours until the cake is firm to touch, or, when pierced with a skewer, it comes out clean. Hope that helps and let us know how you get on! How long do you bake the cake in the oven?